A Chinese Catholic deacon sprays holy water on worshipers at the Palm Sunday Mass during the Easter Holy Week at an ‘underground’ or ‘unofficial’ church near Shijiazhuang, Hebei province, April 9, 2017. Amidst a crackdown on Christianity in China, on September 22 the Vatican and Beijing provisionally reached a major agreement: Pope Francis will recognize seven excommunicated bishops Beijing appointed, in exchange for more influence on who Beijing appoints as bishops in the future. Perhaps mindful of the role the Catholic Church played in the Eastern European democratic revolutions in the 1980s and ’90s, Beijing has long been hesitant to engage with the Vatican. What is at stake in this changing dynamic between Beijing and Rome? Would a deal help protect China’s millions of Catholics, or leave them more exposed? Rome may be eternal, but the governments of China come and go, and as they do they make their own arrangements with the Church. China’s experiences with Christianities of one sort or another reach back about a millennium and a half, but the genealogy of direct negotiations with the Vatican begins at the end of the Ming, when Jesuits were called to account by the Church for tolerating Chinese ancestor worship in their teachings and practice—essentially creating a Chinese dialect of Roman Catholic doctrine. Attempts by Church authorities to suppress the practices in China created a rift between the Vatican and the Jesuits, one that the Kangxi Emperor of the Qing dynasty entered on the side of the Jesuits. For a time, it seemed that the Jesuits and the Emperor would gradually win the argument, but in 1704 a papal bull banished Chinese practices from permitted worship. Despite protests from the Emperor, the Jesuits, and Jesuit supporters, the ban survived China’s imperial period. But the clash changed the Church. In the 20th century, it was forced to reconsider its attitudes toward all native and indigenous variations on orthodox worship. In 1939, the Church permitted the traditional ancestor worship it had banned almost three centuries before, and at the Second Vatican Council generalized the liberality to native practices worldwide, as well as increasing participation by local communities in liturgical functions previously reserved to priests. Today, the Vatican appears ready to enter into an agreement with the current Chinese government that may change the Church again. This time, the Church proposes abandoning its late 20th century positions of accommodating and when possible comforting Catholics worldwide—especially those in the grip of authoritarian or predatory regimes. 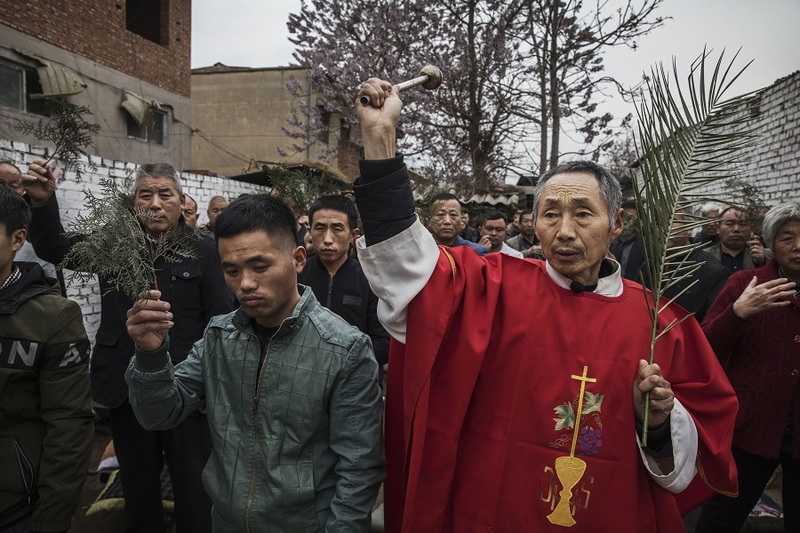 China’s long history of Catholic persistence despite repression by the imperial state and now the Chinese Communist Party (C.C.P.) appears to have culminated in the Church’s repudiation of its own universalist doctrines. It has already ordered Chinese bishops of the underground Church to desist, and now proposes to invest new bishops recommended by the C.C.P. While the great Kangxi Emperor considered himself qualified and entitled to advise the Church on accepting Chinese folk practices, he never dared to direct the Church on whom to appoint as bishops or cardinals. The Vatican is already advising Catholics throughout Asia—particularly Taiwan—that this is an insignificant change, a mere gesture of amicability towards the C.C.P.—something that in theory could spare Chinese Catholics some harsh treatment in the short term. The Church should throw off the blinders. If the Vatican is willing to give the C.C.P. the right to appoint amenable bishops in China, the C.C.P. will soon point out that it has a distinct interest in promoting amenable bishops in many parts of Asia, and certainly in Africa, probably in Latin America, and very possibly in Italy itself. Where Chinese investment goes, C.C.P. interest in acquiescence and harmony follow. Nobody advises on turning the other cheek or handing over your cloak with your tunic like the Church. In centuries to come, many philosophies and their prophets will be forgotten, but the first agreement between the millennial institutions of China and the Holy See—the first time East and West meet without wars or the petty trade exchanges—will remain. And this is not against anybody. Rather, it is designed and thought out to be in favor of everybody. Lee Matthew Shieh-Ming, Taiwan’s Ambassador to the Holy See, even argued that the agreement could work in favor of democracy in China. Discussions about normalization have being going on for over 30 years, and for all that time, the opponents to normalization never produced an alternative. They have been saying, “Don’t talk to the communists.” Did this improve the situation of the Catholics or religious faithful in China? Perhaps it is time to try something else. The issue is extremely complex. The decades of talks demonstrate this, and trying to summarize them in 500 words is beyond my abilities. But to say that Rome is forgetting Catholics in China is false. A small example of the complexity: Bishop Wei Jingyi of Qiqihar is considered a diehard, stubborn leader of the “underground community,” and reluctant to deal with the Chinese authorities. He recently wrote a letter supporting the Pope in the case of the former U.S. Nuncio, or chief diplomat, Carlo Maria Viganò. Viganò’s allies have been militantly against the China-Vatican agreement. That is to say: Viganò challenged the authority of the Pope, and Wei pledged obedience to the Pope against Viganò. In doing so, Wei declared himself in favor of the agreement with Beijing—if the Pope decided so. What is damning is that the agreement comes at a time of greater tensions involving China globally, a time when the ongoing tariff dispute could lead to a new Cold War or worse. But perhaps just because of this, this is the time when the Church, fighting for peace, understanding, and mutual comprehension, will need to go to work. No institution but the Church could convey the concerns and worries of the world about China to Beijing, and at the same time convey similar Chinese concerns to the world. If the Holy See doesn’t do it, perhaps it is betraying its mission. It is not just a chance for the Catholics in China, but perhaps it is a chance for peace with China. If even the Vatican fails, then who knows? On June 21, 1870, a jurisdictional dispute between the French Consulate and Qing imperial authorities in the city of Tianjin led to a day of rage and rioting that left dozens dead and two empires on the brink of war. At issue, the right of local officials to investigate rumors of kidnapping and sorcery which for several months had swirled around the Catholic mission just outside the city gates. When negotiations between the two sides broke down, the local community stormed the French cathedral, consulate, and orphanage. The position of missionaries in 19th-century China was an awkward one. The Treaty of Tianjin in 1858 gave foreign missionaries the right to reside and proselytize throughout the Qing Empire as well as lease or buy property for their work. The subsequent Beijing Convention of 1860, signed while the ruins of the Imperial Gardens still smoldered, reinforced the rights granted in the 1858 treaty while adding the potentially explosive provision that missionaries could petition—and should be awarded—possession of any ecclesiastical or mission properties seized after the court officially declared Christianity a heterodox religion at the turn of the 18th century. In the mid-19th century, under the protection of treaty and gunboat, missionaries flooded into China. Many communities welcomed the contributions made by the missions, including clinics, schools, orphanages, shelters, and food pantries, but missionaries in many areas also found themselves the most visible representatives of a system that many people deeply resented. The arrogant missionary naively and rudely using his privileged position to interfere on behalf of Christians wasn’t nearly as universal as hysterical local officials suggested in their beleaguered memorials to the capital, but such incidents happened often enough that anti-foreign violence was a perennial concern in the last decades of the Qing Era. The presence of missionaries also raised the stakes for imperial authorities. In Tianjin in 1870, local officials stationed in the city found themselves in a no-win situation. If they investigated the allegations made against the Catholic mission, they might precipitate an international crisis or a military response from one or more of the foreign powers. On the other hand, standing on the side of the foreigners and protecting the rights granted by the treaties might leave the officials caught between an angry mob and the object of the mob’s ire. The inability—or unwillingness—of Qing officials to stand up for local interests when those interests collided with foreign privilege gradually eroded the authority of those officials and the government they served. Just another stone in the pocket of a dynasty already floundering from the weight of multiple crises. The Communist Party’s distrust of religion springs from many sources. It is a fear of organizing outside the control of the Party, of foreign ideas, and of values which transcend the narrow loyalties of nation and Party. But it is also a memory of a destructive era of gunboats and treaties—an era for which foreign missionaries and foreign religion remain a highly provocative and visible symbol. The provisional agreement signed between the Vatican and China over the Chinese-nominated Catholic bishops was described as a “rapprochement” by the Vatican, and “improving relations” by the Chinese foreign ministry. This new moment of tentative agreement, and its optimistic language about the future of this budding relationship, occurs in the context of centuries of fraught history. I want to focus on tensions that emerged in the 19th century, when rapprochement also seemed to have been reached after Catholicism—underground for generations after Emperor Yongzheng’s 1724 declaration of its heterodoxy—received official sanction to practice openly again alongside other forms of Christianity in the Treaty of Tianjin (negotiated 1858). Prior to this explicit endorsement, other treaties signed after the First Opium War (1839-1842) steadily chipped away at Chinese restrictions on Christianity, leading to increasingly open worship and missionary activities by both Catholics and Protestants. What the Chinese state has never forgotten, through successive governing systems and ideologies, is how this particular arrival of Christianity coincided with the beginning of what China calls the Century of Humiliation. The “treaties” described above were negotiated by means of gunboat diplomacy, with Western states demonstrating a hearty disrespect for Qing governance as they demanded unrestricted access to the empire’s markets, consumers, and souls. The power dynamics of this new era of compromise are incredibly different, of course, but the tensions of the 19th century yet inform our present. For most Chinese with some political influence in the late Qing, Catholicism would never lose its taint of heterodoxy. On one extreme, we find Zhou Han (1841-1911), who published virulently anti-Catholic screeds in Hunan in the 1890s with titles like “The Heavenly Pig Squeals” (punning on the similarity of “lord” and “pig” (zhu) and “religion” and “squeal” (jiao)). What we should take more seriously as evidence of a tension still at the core of Sino-Catholic relations, however, is expressed in a more measured fashion by prominent Yangzi Delta philanthropist Yu Zhi (1809-74). While he praised Qing magnanimity in legitimizing Catholicism in the spirit of friendly international relations (sound familiar? ), Yu also railed against its spread, claiming that it was the single greatest threat to Qing stability because it destroyed the state’s hold on a unified system of governance and religion both centered on Confucianism. In keeping with centuries of tradition, heterodoxy was not defined by specific practice as much as it was by perceived threat to dynastic stability. Church (here broadly defined) and state are inextricably bound in traditional China. Over a century later, official position on religion has changed surprisingly little. All orthodox religions explicitly support the state; those that don’t remain heterodox and underground. In the late Qing, as governance crumbled, so did the Chinese state’s perceived hold on religious orthodoxy within its porous borders. Now, in the early 21st century, the Vatican has implicitly endorsed China’s increasingly rigid controls on its peoples’ religious practices precisely as it steps up repressive crackdowns on ever more broadly defined heterodoxies. This July, Taiwan was a participant in the first-ever Ministerial to Advance Religious Freedom in Washington, D.C., held to advance religious freedom globally. As one of over 80 countries invited, the Taiwanese delegation, led by Taiwan’s representative to the United States, Stanley Kao, mingled and participated in round-table discussions with Ministerial participants. As the Chinese Communist Party continues to infringe and tarnish rights of Christians, Catholics, and Muslims to freely practice their religion, Taiwan is recognized by the international community and NGOs as one of the freest countries in the world. Recently, a number of investigative reports and articles have shown the persecution of religion in China, including church, cross, and Bible burning and mandatory support of the Chinese government’s rhetoric on religion. Those who do not follow the Chinese government’s demand are banned or prevented from practicing their religion. Churches are being ordered to display the Chinese national flag, as well as a portrait of President Xi Jinping. Christians in China are not the only ones under increasing government control and facing persecution. The Chinese government’s atrocious treatment of Muslims is now finally recognized by the international community. According to a member of the U.N. Committee on the Elimination of Racial Discrimination, China “has changed the Uighur autonomous region into something that resembles a massive internment camp that is shrouded in secrecy, a sort of ‘no rights zone.’” The Chinese government is keeping some Uighur children in state-run orphanages in a systematic attempt to distance Uighur youngsters from their culture and identity. Meanwhile, Beijing poached three of Taiwan’s diplomatic allies this year, as it continues to aggressively undermine Taiwan. Beijing has long set its sight on forming diplomatic relations with the Vatican. The Vatican, however, is communicating that its agreement with Beijing is an insignificant change and only an amicable gesture. Such a gesture only works in theory, as no agreement with the Chinese government is without future payback or repercussions. This agreement also sets precedent to allow China to promote amenable bishops in the region, in Africa, and wherever Chinese investment goes. However, Beijing’s increasingly oppressive stance towards religion also enables Taiwan to further set itself apart from China with its multifaceted, inclusive, and sensitive environment for all religion—consider, for example, the increasing numbers of prayer rooms in public facilities throughout the country, the spread of Halal restaurants, and the public religious events for all religions. Taiwan, yet again, shows how it is a beacon of democracy and freedom, everything that the Chinese government is not.